1. This site is fully responsive. It should look and function beautifully on any device: desktop computers, laptops, tablets, and phones. Unlike the previous sites, this site is clear to understand and maintains full functionality no matter what device it is viewed from. 2. We added a news and updates page. 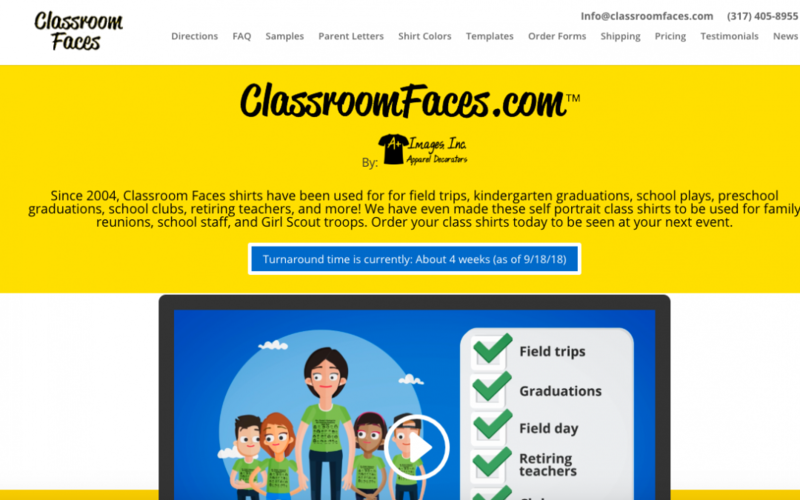 This page will list any updates regarding anything related to Classroom Faces shirts. This includes, but is not limited to, changes in shirt colors, changes in ink colors, new templates, contests/giveaways/specials, turnaround times, and more. 3. An instructional video that gives a quick, one-minute overview of the ordering process, is prominently displayed on the home page. 4. A written overview of the process has been added to the home page. Like the video, these directions now show step-by-step instructions on the ordering process, making it easier (especially for first time users) to know exactly what to do. 5. Revised page organization. The pages of the site now go in order of the ordering process. “Next step”, “back”, and “home” buttons now appear at the bottom of each page making it easier than ever to find everything you need to create the world’s most amazing class shirts! We hope you enjoy using the new website! Get started on your Classroom Faces shirt order today!